Usually modak is made with rice flour and it is steamed. 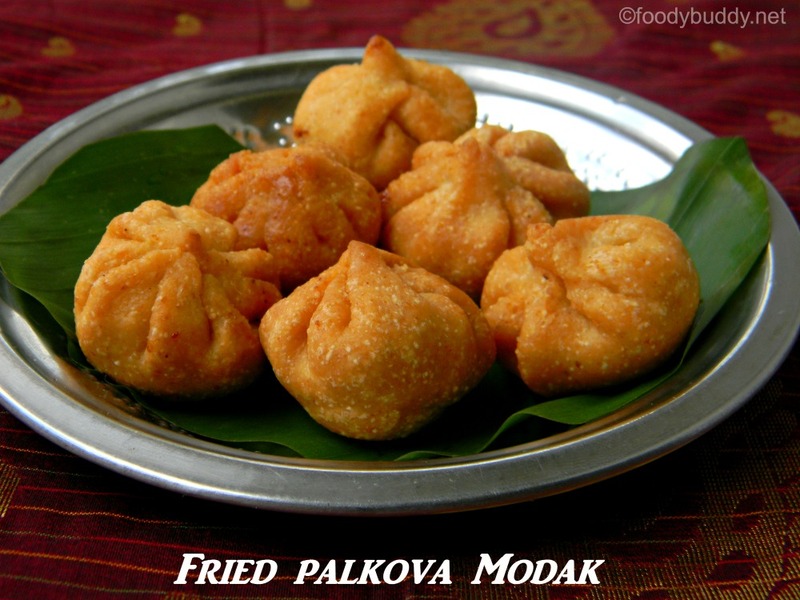 Here in fried palkova modak recipe it is deep fried, made with maida for outer covering and palkova for inner filling. The semolina we add here make the modak super crispy. 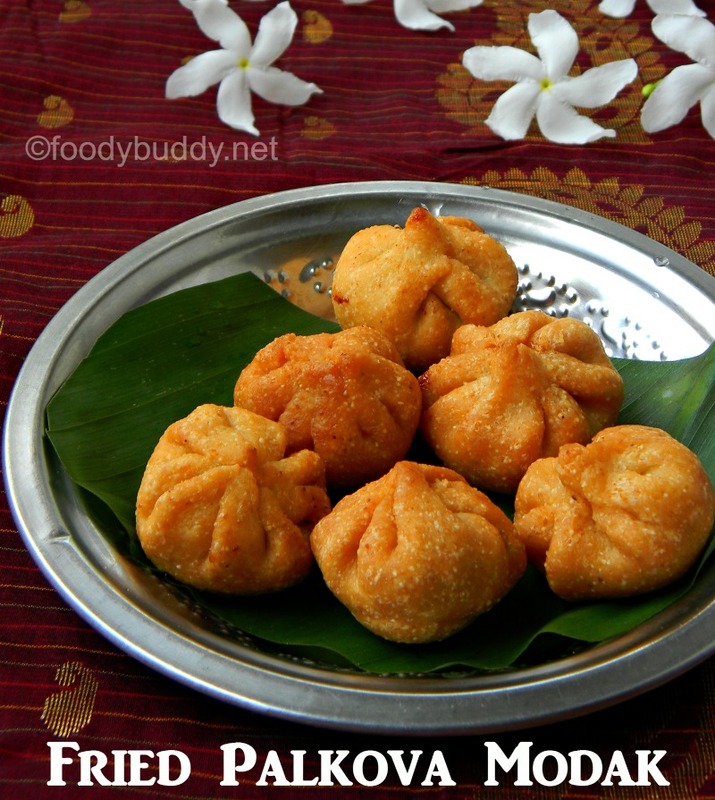 This is my mom modak recipe and she tried the fried modak with coconut jaggery filling. I thought this kozhukattai recipe was quick to make when compared to the regular kozhukattai. Recently I tried my hands on Fried Modagam but I want to try it with something different filling so I used palkova for inner filling, I was little nervous that the filling would come out and spoil the oil. But it came out nice and it was awesome in taste. You can use any filling that’s your choice, either coconut jaggery filling or dal jaggery filling. In a bowl, add maida, sooji,salt and oil. Mix it well. Add water slowly little by little and knead it to a stiff dough. Let it rest for 15 minutes. Then knead it again by using all your stamina and make small balls out of it. Take a ball and roll it like thin chapathi using rolling pin. Take a spoonful of palkova and place it in the center. Start pinching the edges like shown in the above picture. Finally bring all the edges to the center and seal it. Repeat the same process for the rest of the balls. Heat the pan with oil, once it is hot, keep it in a medium flame. Fry the modak until it turns golden brown. Drain it in a paper towel and serve. 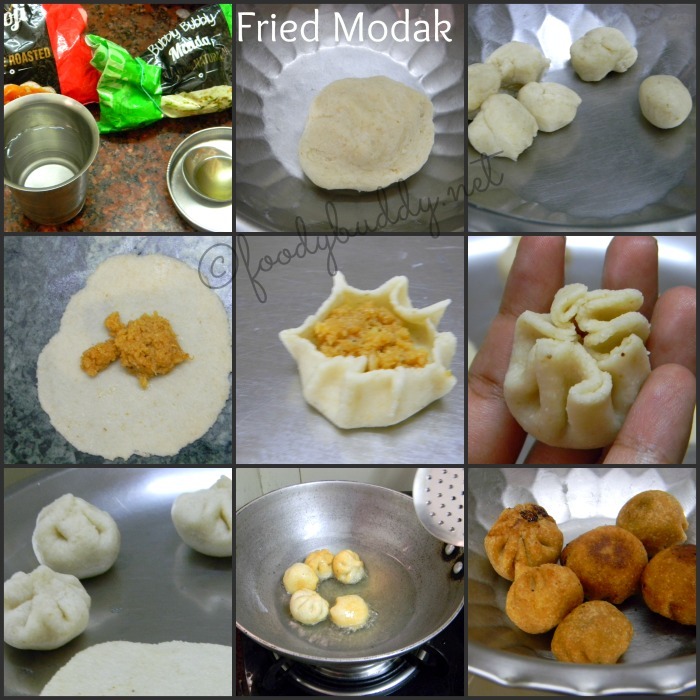 Fried modak stays crisp and good for few days. Make sure you seal the modak correctly, otherwise it will open and spoil the oil. You can also use whole wheat flour or 50-50 maida and wheat flour. It takes little more time to cook so that it cook on inside.. So cook in a medium low flame. If you cook the modak for more time than needed, it will turn hard. you can also fry it in ghee, to get super tasty modak.